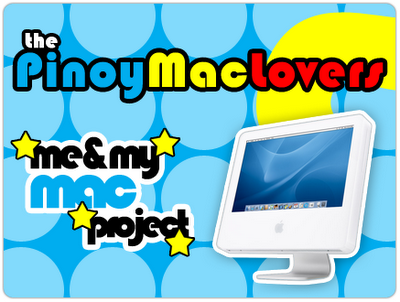 A few weeks ago, I posted some pictures of PinoyMacLovers reader Nic's very cool Mac home setup. Today, we are going to take a peek inside his automobile and see his very functional in-car music system. His iPod sits securely on a Griffin TuneFlex docking cradle. It has a flexible stem which allows you to adjust the cradle's position to your liking. It also plugs into your car's 12 Volt accessory outlet allowing you to charge and power your iPod. TuneFlex is also equipped with a standard 3.5mm line-out port so you could easily connect it to your automobile's stereo system. It also features a pass-through dock connector so that you can use it simultaneously with other devices like iTrip or AirClick. Nic uses the Griffin AirClick so that he can easily control his iPod using the remote, which conveniently straps to the steering wheel (you can also attach it to the hand brake). It has five simple buttons (pause/play, previous, next, volume up and volume down) which you can easily navigate through using your thumb without having to take your eyes off the road. Right-click (or control + click) on the file or folder that you would like to ZIP, then click on "Create Archive"
Voila! All zipped up. And you can unzip these files even if you open them in Windows. In the previous post, I talked about the nice little application called Pic2Icon, which is a great tool to use if you want to create icons out of picture files. What Pic2Icon does is it uses the contents of an image or picture file to create an icon, which it then applies to that original image file. So in effect, the original image file, ends up having a thumbnail of itself. There are other icon creation programs out there that are able to convert images into actual Apple Icon Image files (this type of file has a .ICNS extension), instead of just creating thumbnails. These Apple Icon Images or ICNS files can then be used as icons for your Mac applications. One such application that creates ICNS files is Iconverter by Extraneous Software. This FREE program allows you to convert image files into ICNS files. It supports formats such as JPG and PNG, to name a few. You can use it to convert single files or choose to process an entire batch. It also allows you to go the other way around and convert ICNS files into image files instead. Oh, and it lets you convert pictures into Windows Icons too (those files have .ICO extensions). Pic2Icon has options for anti-aliasing and adding drop shadows, while Iconverter does not. However, these are things that you can easily add when you create your images using a graphics editor like Adobe Photoshop. If you have a poor quality image to begin with, applying anti-aliasing and adding a drop shadow to it using Pic2Icon is NOT likely to result in a significant improvement in quality. Iconverter, on the other hand, can create actual ICNS files. This feature makes it the icon creator of my choice. I've always wanted to create my own Mac OS X icons eversince I found a few cool ones while surfing for some nice artwork at DeviantArt.com. My problem was that I couldn't find a FREE application that could let me do so. The only thing I could find was IconBuilder by the IconFactory. It's a plugin for Adobe Photoshop designed to help you easily create icons. Price tag: $79(USD). Ouch! As much as I wanted to create my own icons, I wasn't willing to shell out that much money. Of course IconBuilder does come with a few extra features such as the ability to create 1024x1024 icons (that's LARGE - if your display has a resolution of 800x600, your icons would actually be BIGGER than your desktop) as well as the ability to create icons for Windows (can't imagine what I'd use that feature for). But really, all I wanted was a simple icon creator. And finally, after months of searching, I found Pic2Icon. Developed by Mike Margolis, Pic2Icon is an application that allows you to create icons out of picture files (supports TIFF, JPG, PNG and many other formats). And it's FREE! Yey! It also works great and has easy drag and drop functionality. To create an icon, drag your picture file into the Pic2Icon well (for this example, I used the apple from the PinoyMacLovers logo, which I saved as a PNG file with a transparent background). Voila! Pic2Icon turns the actual picture into its own icon, retains the transparency and applies anti-aliasing (prevents jagged edges). Besides being 100% freeware, Pic2Icon is 'Get Mike an internship at Apple doing Cocoa development'ware. Basically, whoever gets me the coolest internship at Apple this summer gets a registered copy of all future versions of Pic2Icon. Pic2Icon is a pretty old app and hasn't been updated in awhile. For something newer, you might want to try Img2Icns. You can download the free version that exports to .icns files and folder icons. The pro version lets you export iPhone icons and favicons, and lets you convert icons into images. His home setup involves a large 40-inch Toshiba Regza flatscreen TV hooked up to his very lovely MacBook via a mini-DVI to VGA adapter. And just a few feet away is his spacious desk where he can work and play using his Apple Wireless Keyboard and Mighty Mouse. This is definitely one pretty cool setup. 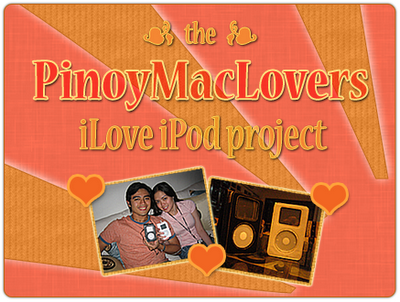 Disclaimer: The PinoyMacLovers Me & My Mac Project is an independent project and has not been authorized, sponsored, or otherwise approved in any way by Apple, Inc. The use of any of the images featured in this project, in whatever manner and for whatever purpose, is prohibited without express and written authorization from the author.